Current FIFA, USSF, US Youth Soccer, and Mass. 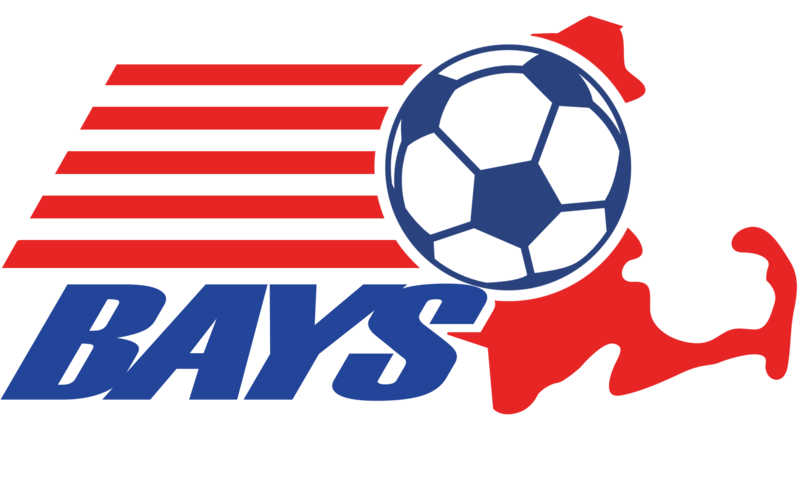 Youth Soccer rules of play shall be in effect, except as specifically stated otherwise in the section titled “Rules for BAYS Soccer Competition” or in these bylaws. There is no limit on the number of players allowed on a 7v7 team. BAYS, however, strongly encourages limiting rosters to 11 or 12 players so that a reasonable amount of playing time will be available for each player. Instead of the regulation eleven players on the field, there shall be seven players including the goalkeeper. A minimum of six players must be present to start a game, and a minimum of five qualified players must be available to continue a game. There will be NO OFFSIDE in 7v7 play. On fields without goal areas marked, goal kicks shall be taken from within six yards of the goal line and within the penalty area (otherwise goal kicks are taken from within the marked goal area). The team not in possession shall withdraw to its defensive half of the field and may not enter its offensive half of the field until the ball is kicked and moved. Should the team in possession put the ball in play before the opposing players have taken position in their defensive half, play will continue. Indirect kicks awarded to the attacking team within the penalty area will be placed at the spot of the infraction, but no closer than six yards from the goal / goal line. On goal kicks, or on goalkeeper saves followed by a throw-out, punt, or drop kick, the ball must touch the ground or be touched by any player in the defensive half of the field. Infringement of this rule will result in a turnover of the ball to the other team. Play shall restart with an indirect kick at the midfield line nearest the point of contact. Penalty kicks will be taken from a point eight yards directly in front of the midpoint of the goal. All other players must stand beyond the midfield line. The ideal field size for 7v7 is forty yards wide by sixty yards long. This will not be a rigid requirement, as some organizations will, because of limited space, have to play their games across the width of regulation fields. An acceptable range for field size is thirty to forty-five yards wide and fifty to seventy yards long. Downsized goals will be used which should be approximately twelve feet wide by six feet high (for 4th grade and younger), or the next adjustable size larger (for older teams). They must be anchored securely to the ground. For non-MTOC eligible teams: there is no limit on the number of players allowed on a 9v9 team. BAYS, however, strongly encourages limiting rosters to 14 to 16 players so that a reasonable amount of playing time will be available for each player. The roster size limit for BAYS 9v9 teams eligible to play at MTOC will be identical to that established for MTOC play: 16 players. This limit is for both Spring and Fall season play. Instead of the regulation 11 players on the field, there shall be nine players including the goalkeeper. A minimum of seven players must be present to start a game, and a minimum of six qualified players must be available to continue a game. Goal kicks shall be taken from within six yards of the goal line. Penalty kicks will be taken from a point ten yards directly in front of the midpoint of the goal. Note: Although not a modification, the OFFSIDE rule will be in effect. The ideal field size for 9v9 is 70 x 50 yards, with a 14 X 34 yard penalty area. These are not rigid requirements. Clearly visible dots or dotted lines may be used to mark the penalty areas to avoid excessive lining and confusion on regulation fields. Intermediate goals of 6 ft x 18 ft are recommended, but again this is not a rigid requirement. The goals must be anchored securely to the ground. There is no limit on the number of players allowed on a Fall Only Small Sided High School Team. BAYS, however, strongly encourages limiting rosters to 12 to 14 players so that a reasonable amount of playing time will be available for each player. Instead of the regulation 11 players on the field, there shall be seven players including the goalkeeper. A minimum of six players must be present to start a game, and a minimum of five qualified players must be available to continue a game. There will be NO OFFSIDE in Fall Only Small Sided High School Matches. A match will consist of two halves of thirty minutes each. Penalty kicks will be taken from a point twelve yards directly in front of the midpoint of the goal (regardless of goals size used). The ideal field size is 70 x 50 yards, with a 14 X 34 yard penalty area. This is not a rigid requirement. The original 11v11 touch lines become the end lines and a full size 18x44 penalty area shall be indicated. It is recommended that the centerline of the original 11v11 field be one touch line and the top of the penalty area line be extended for the other touch line. Full size goals shall be used. Penalty Area to Penalty Area on full size field with full size goals. The full size goals shall be moved to the top of the penalty area and a new 18x44 penalty area shall be indicated. Clearly visible dots or dotted lines may be used to mark the penalty areas to avoid excessive lining and confusion on regulation fields. While it would be ideal for marked goal areas in all field configurations, if the goal areas are not marked the referee shall have the authority to estimate the distance (and so instruct the players) for any restarts required or prohibited from being taken in the goal area.